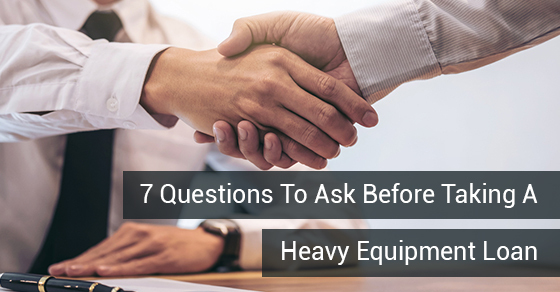 In order to receive a loan for the purchase of a heavy equipment, you need to ask yourself some few questions. After answering the questions, you can choose the right lender and know precisely the right amount you require. Many of the loan borrowers do not have sufficient measures for applying for a loan. Therefore, it poses some doubt to the lender concerning the credibility of the client. When applying for a car loan, shop around for interest rates. Different lenders will have different car loan interests. Choose the lender who provides an interest rates affordable depending on your budget. How Much Can You Contribute Before Taking a Loan? The trend is that you should contribute more than 20 percent for the total amount of the truck. However, some banks even offer to provide the whole amount for the purchase of the heavy equipment. When taking an equipment loans, it’s suggested that you take the 20 percent rule to ensure all of your returns do not go into paying off the liability. Also, you can stop some of your other primary expenses to cater for the repayment of the heavy equipment loans. What is the Final Amount Payable? Consider the amount of money you will have to pay after going through all the loan processes. With some lenders, even if you get the equipment loans at a lower rate, you will end up incurring other minor charges that can raise the total amount. Some of these charges include foreclosure, documentation, late fees, and processing. When Should I Pay My Down Payment and For How Long Can The Loan Last? There will be a fixed period to repay the loan. However, you should not plan on using a much lesser time to pay off the loan since it can be hard on your budget. On the other hand, do not extend the payment period so much since it will attract an enormous amount of interest. What Extra Charges Can Come Up? Many banks will assign some more expenses during the loan application. Therefore, you can compare the fees for every lender to choose from the one fit for your budget. Is There any Penalty if I Pay Early? Some lenders charge the foreclosure charges and other levy fees if you pay off the loan before the tenure. In this case, you should go for those that cost less. When applying for a loan, be prepared with some documentation to make you eligible for the credit. These documents are; business proof, bank statement, or a partnership deed. Also, you can contact the heavy equipment loan experts for assistance.